The end result was fairly depressing as we contemplated the much higher peaks to come later in the week. We returned to Arequipa to consider things over a few beers. One point possibly in our favour was that the lack of luggage meant we had to do today's climb in jeans. After the first day, we had a day up on the altiplano at over 4000m doing some birdwatching around the salt pans. 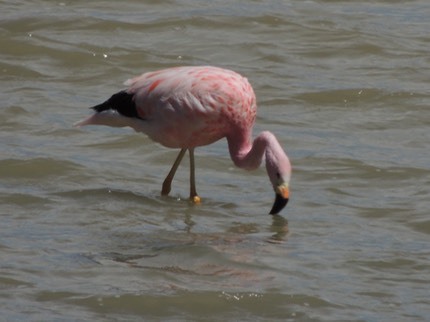 Good numbers of flamingoes were seen and they definitely look out of place here. 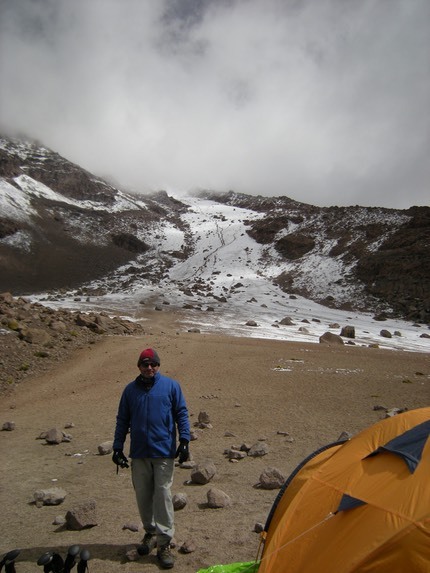 For us it meant a good amount of time at altitude to allow us to adjust to the lack of air. As we returned from the day, our guide rang the hotel and announced that our luggage was there. A huge relief. 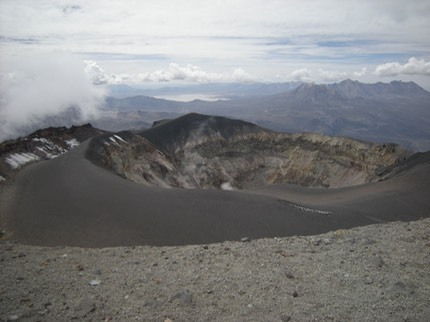 El Misti is an active volcano that dominates Arequipa. You can see it from almost everywhere and many businesses have adopted it as a logo. It's as near a perfect volcano shape as you'll find anywhere and is largely composed of a massive layer of ash over rock, making walking up quite difficult. This is the contemplation phase as I consider the 2 day challenge that lies ahead. 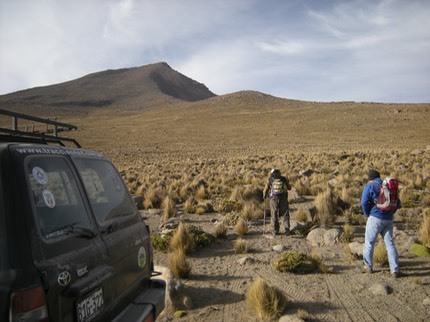 On the first day the car dropped us at about 4100m and we started the slow climb to where we would camp at 4800m. It took 3 hours to make this small climb and we arrived in time for a lie down in the sunshine to recover before eating dinner, prepared by our porters, Toto and Gary. These guys had carried 35kg each and beat us to base camp by enough time to have our tent ready for us. Dinner was soup and spaghetti with meat balls, good solid stomach fillers. We were informed that breakfast would be at 3am and we would set off 30 minutes after that for the summit. The only thing to do was to settle down in our sleeping bags and try and get some sleep as temperatures plummeted and to take a cocktail of drugs to help. Nurofen, Sudofed and Diomox were lined up to tackle headaches, nasal passages and nausea, washed down with Coca tea. At 3.30am, after a breakfast of porridge we set off with (a different) Carlos setting the pace. It's hard to describe the pace but you are essentially competing in a slow walking race where the aim is to try and move forward and upward one step at a time. You have to absolutely minimise wasted steps as the energy loss is huge. Bending down and back up is excruciating so I quickly learnt to rest standing up and ensure that my walking poles were accessible without bending down. After 3 hours of walking we had reached 5400m at which point Rob said he wouldn't go any further. We had a pact in place that no obligation would be put on the other person in this case so Carlos pointed the way off the mountain for Rob as we started again and moved on. After a very tricky section over a rock field and then a steep zig-zag climb up the last stretch I reached the top some 2.5 hours later. 5825m at which point some one had planted an 18ft iron cross. 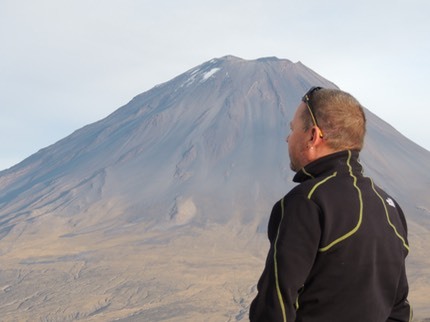 After photos and taking in the impressive views of Arequipa and all the other volcanoes we set off for the car. After all that effort it only takes about 1.5 hours to get down. Nice to have El Misti in the bag, but the hardest thing I have ever done. Paul on the top of El Misti. El Chachani is very different to El Misti. It is an extinct volcano and largely hard rock. 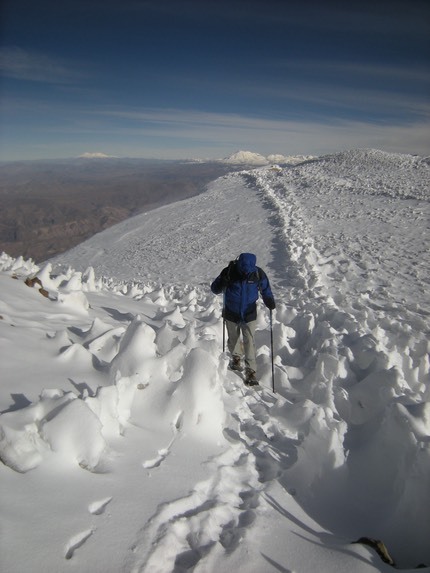 As we set out from Arequipa we ran into unseasonable snow around the mountains. By the time we had reached the point where the car stopped it was a complete white-out. We met an American who had just completed the climb and said he hadn't been able to see anything at the top as the snow was falling so thick. We got our gear ready at 4800m for the climb to base camp at about 5100m This, in itself was a challenge due to the weather and it took a solid 3 hours to get there leaving us prematurely tired. The picture below shows Rob in front of the initial part of the climb. It looked steep and with cloud covering the top left us no idea where we were to go. Breakfast was set at 1am and we would set off at 1.30am. This meant at least 3 hours in total darkness with torchlight to guide us. As expected it was a hard slog, slowly inching forward, gaining height all the time. As dawn broke we were inching across a steep face, on ice and slippery stones. To be honest I wish it had stayed dark for an hour longer. As the snow deepened we encountered ice fields and some tricky ridges. This was not how it looked in the guide books!!. 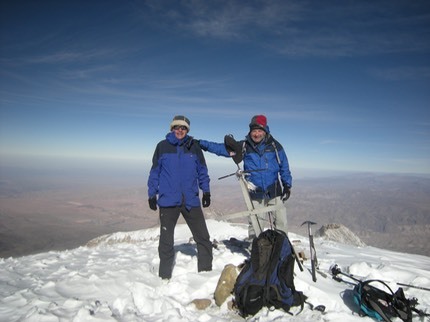 After 5.5 hours of climbing, and with increasingly cold hands Gary, our guide, announced that we had reached 6000m and the summit was close. 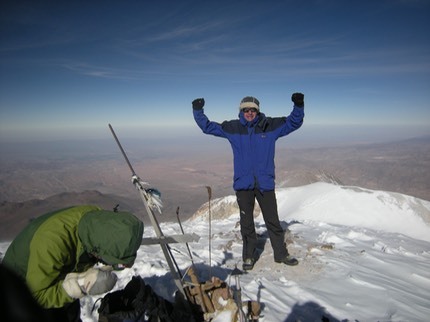 Pushing on for the last 45 minutes saw us reach the summit at 6075m, higher than Kilimanjaro and very close to 20,000ft. The relief was enormous and we posed for the obligatory photos. It was too cold to stay long so we quickly departed on the difficult descent to base camp which took a further 2 hours where we were met by coca tea and more porridge. A quick rest and then we set off on the last couple of hours back to the car point. There were a group of 8 climbers there pleased to hear of our experiences, but looking increasingly worried as we described our trip. This mountain is sold as one of the easier 6000m peaks in the world, but having been there I wouldn't describe it as a walk in the park! 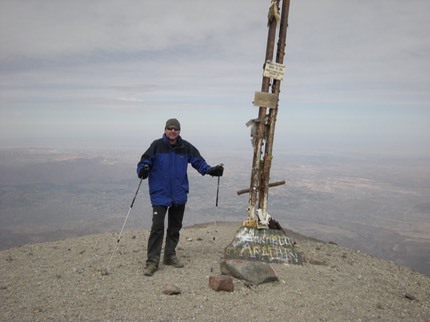 With a 6000m summit now crossed off my ambition list I intend to concentrate on some less strenuous ambitions in the future. Maybe moving to the country and growing vegetables. Watch this space.